There’s nothing better than kicking your feet up and reclining your way into relaxation. Except when your head sits above the backrest unsupported and your feet dangle over the footrest. Then it becomes just plain old irritating to say the least. 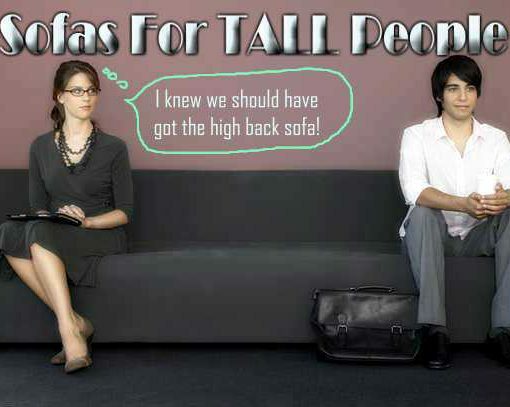 This is what many of us taller people endure on a daily basis. Not knowing recliner chairs for tall people even exist, they persevere with the pain and discomfort. But not anymore!. If you or someone you love has been putting up with short length recliners, then it’s time to say enough is enough. No more putting up with second best when what you are about to discover on this page may change your seating habits forever. 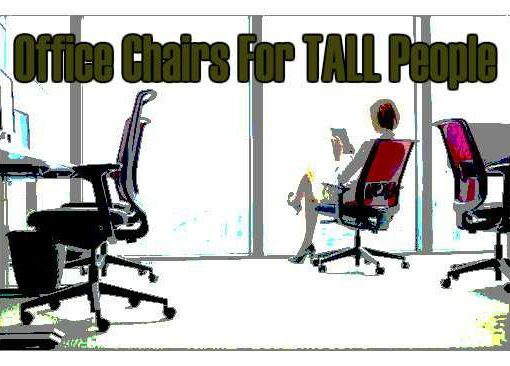 That’s right tall people of the word, I have made it my mission to seek out recliner chairs for tall persons to relax and enjoy year in year out. I don’t care if your partner or friends find these recliners ‘too big’ for them. 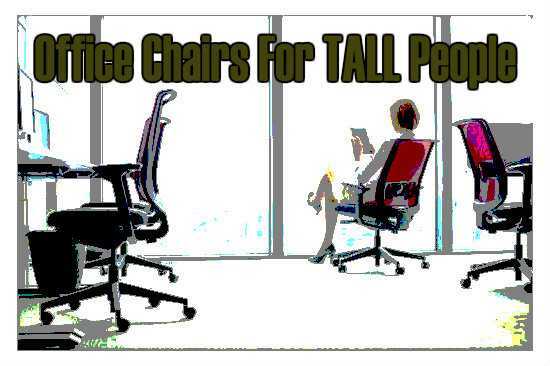 It’s time the tall people unite and finally treat our lanky bodies like the gods we are. Ok enough of the drama, its time to get to the real reason your here. To find extra long recliners in which a tall person can lay back and kick up the feet in.Do not the recliners mentioned below are single seat recliners. If you are after more seats you should check out the reclining sofas for tall people. But before you buy just any recliner, there’s a few important things we need to discuss first. Do note these are recliner chairs designed for indoors. If you are after exterior chairs your best bet are extra long zero gravity chairs. So there are the obvious measurements you will need to work out. Not all tall people are 7 foot. So a recliner suitable for a 6 foot person most likely won’t be suitable for a 6’5″ tall person for example. 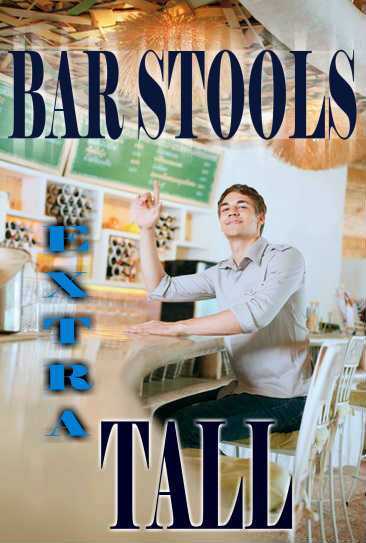 Backrest – Not all will get the luxury of a full head supporting backrest, some peoples heights are simply too tall. As a guide I would be looking for a back rest of no less than 25 inches in height. Depth of the seat – This is the measurement from the back of the seat area where you sit you backside on to the front edge. This is an important measurement for people with longer legs. If you have a longer upper torso and your legs aren’t all that long, a seat with too much depth will be uncomfortable. The seat will be digging into the back of your legs near the knees. Lastly, the foot rest – Goes without saying how important this one is. However some people, like myself, don’t mind if the feet hang of the end of the footrest slightly. Provided it is well padded and doesn’t dig into the back of the ankles. 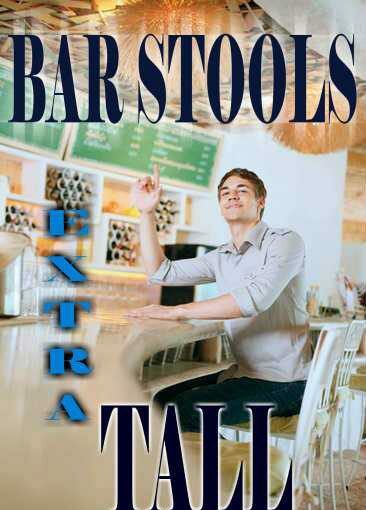 But if you need your entire foot supported, be sure to check out the length of the foot rest and how far it extends. The base of your heel should be well supported by the footrest with the footrest angled downwards slightly. Once you have your measurements in order, yes you should go get the measuring tape and measure the top of your heat to your tailbone etc. Deciding on the type of recliner you desire is the next step. 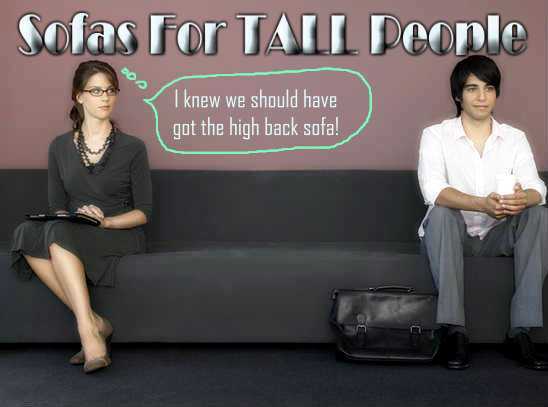 If you are big and tall, as in fairly wide and heavy, then you may be limited by the amount of recliners suitable. But if you are average size but just tall, then the options are far greater. There are certain features on a reclining chair that are unique to each style or model. This will also come down to your needs. For example a wooden release handle may be too difficult for an elderly person to reach and wrestle with. So a push button or recliner with a remote control may be in order. Anyways, this is for you to decide on. 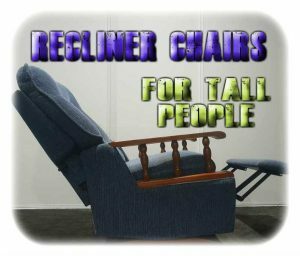 So with that said, lets take a look at some of the more popular and highly regarded recliner chairs for tall people. Different styles of chairs will be presented with varying unique features. So skip down the page until you see one that pops out at you. Not only is the Stallion by Lane Furniture a great choice for tall people, it’s also the ideal recliner for heavy people also. Boasting a huge weight capacity of 500 lbs, many overweight big and tall people are going to love the Stallion. Suitable for people up to the height of 6’8″, the Stallion is one of the biggest recliners in terms of suitability for taller persons. So much so that when the Stallion is fully reclined it has the same length of a king size bed which is 80 inches. Most recliners have a fully reclined length of 50″ to 60″, so you understand just how long this recliner can be. It is not a wall saver, so you will need to keep this in mind before you buy. Do you have enough room to put the recliner out front the wall a foot or two as the Stallion needs its space to spread out. It can’t be snug up against the wall. The width between the arms is quite generous as well. A full 26 inches of space makes it perfect for the big and tall people. As for height, the seat sits at the perfect height for tall people so that your feet don’t dangle of the ends of the footrest. The seat sits 22 inches from ground level, which also makes getting in and out of the chair super easy. Overall the Stallion is one of the best recliners for tall people down to its oversized dimensions. It’s a very well padded chair offering plenty of support for the bigger guys. It’s a pretty basic design with the old traditional lever on the right hand side. If you have problems yanking on a handle located here, then the Stallion is probably not for you. A power lift chair is a necessity for the elderly, overweight and people with bad backs. These recliners make getting in and out of a comfortable recliner a problem no more. The Mega Motion power lift reclining chair has the best measurements in regards to fitting a tall person up to 6’6″ in height. 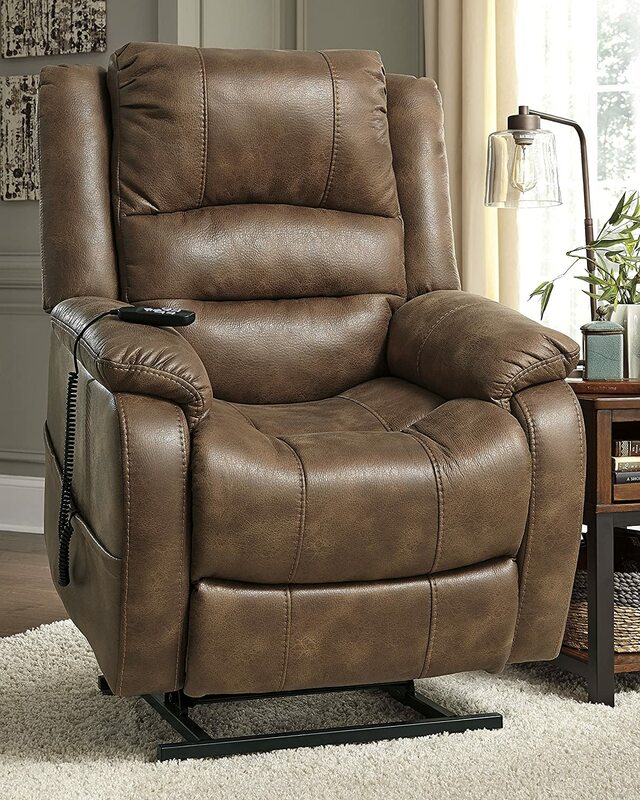 With a floor to top of backrest measurement of 49 inches, you won’t find too many other recliners this tall. Once you’re in the seat, the backrest is a generous 29 inches in height. This is the ‘Tall Version’, so back of the neck can finally get support. Most recliners are on average 20 inches tall in regards to a backrest. So this extra 9 inches certainly does help. The total recline depth is 72 inches, which is sufficient for a taller person as the power lift does not lay back completely flat. So you don’t need the full 80 inches like the above Stallion. In terms of features, this Mega Motion has thought about it all. 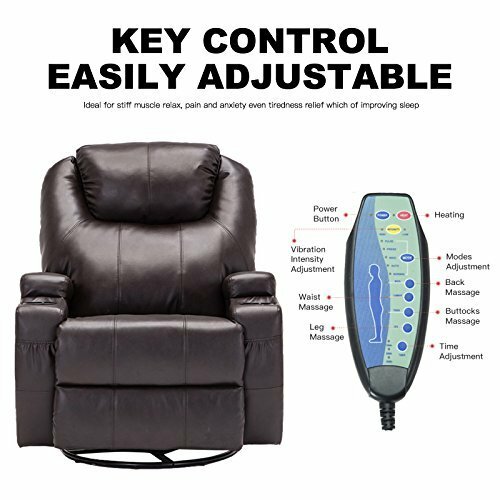 The most important feature for a power lift recliner is a back up power source. If anything were to happen and you loose power, you might find it hard to get out of the recliner due to injury, size etc. This recliner comes with a back up battery powered device for just the occasion. So you can recline back during the worst storm known to Man and still have the confidence that you can safely get out of the chair should you lose power. Overall its hard to find a better power lift recliner for a tall person. The size of this chair was designed to be extra tall and the safety features make this chair a class of its own. 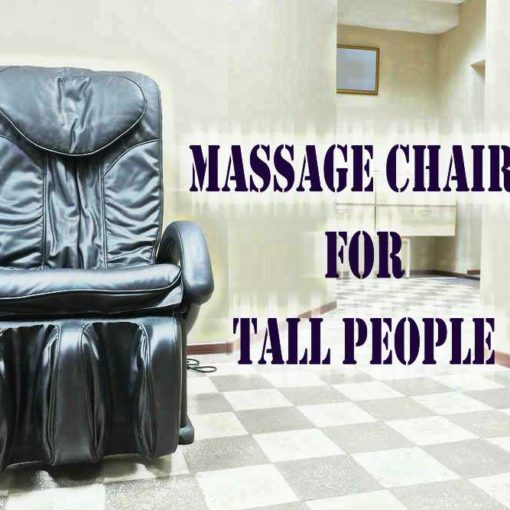 Mega Motion Power Lift For Users 6'6"
For the taller person wanting to completely relax and unwind from a hard days work, there’s nothing better than a full body massage. Whats better is that this recliner offers both massage and heat therapy for reliving tired sore muscles. While it only measures 42 inches in height, the headrest is extendable and can be adjusted to suit your height. For a comfortable fit, I would reckon that it’s ideal for people about 6’5″ tall. Again, the size of your legs and inseam come into play here. But overall it’s a bigger recliner than most. Introducing the Suncoo massage and recliner chair with a full 360° swivel function. When it comes to affordable recliner chairs with luxury features, the Suncoo is my top choice. It has the lot. In terms of massage, there are 8 massaging nodes located for optimal blood circulation and pain relief. Do note that when using the massage features you probably will need to turn the TV up as it does produce some noise. Not overly offensive, but enough to notice it. The massage and heat goes all the way down to the footrest, so no matter where you are sore, the Suncoo is up for the challenge. The chair is not only a recliner, but also a rocker as well. So it’s a chair built for many occasions to ensure everyone is happy. It even has built in cup holder for sitting back and watching your favorite movie. On the right side is the manual release switch that is very simple to use when compared to the older style handle. Just below it is a large storage pouch which puts an end to forever looking for lost TV remotes. Or its a great place to keep a magazine to read when relaxing. I’m not a huge fan of bonded leather, so I would recommend protecting it with a blanket or towel when using it. This will help to make it last longer. The other gripe I have is that the 360° swivel can’t be locked into place. While most of the time it’s not a problem. But if you are reclined back and one of your kids jumps up on you it can be enough force to make the recliner swivel around. Only a small gripe nonetheless. I love the simplicity and ultra plush appeal to the Ludden by Ashley Furniture. 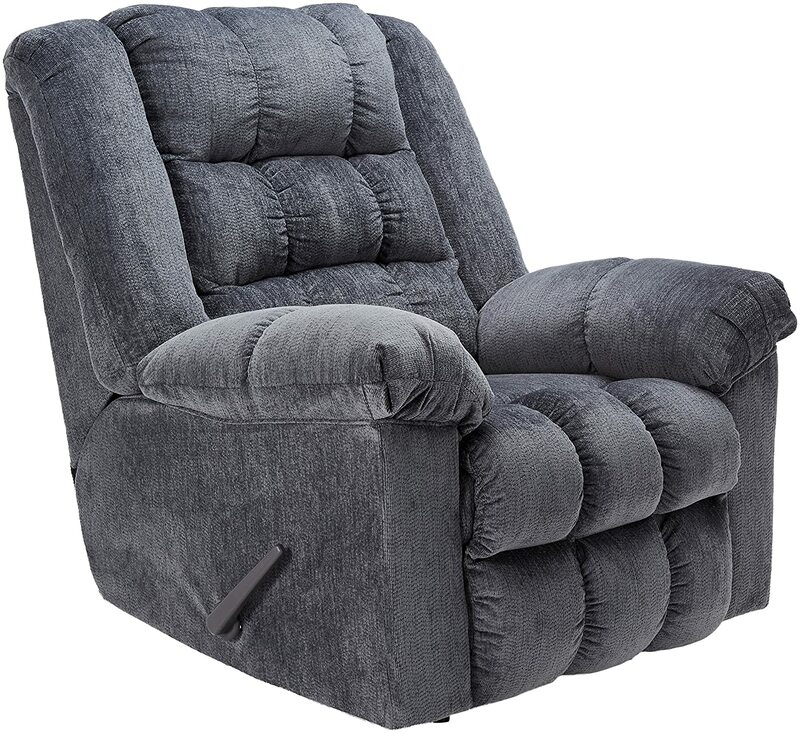 Super comfortable and extremely well padded, this recliner is a great choice for tall people. When fully reclined it spreads out to a decent 70 inches. With the natural slope and angle of the recline, tall people up to about 6’5 will find this chair a awesome fit. Any taller and your feet may slightly dangle over the edge. But as it is super well padded, this is not such a deal breaker. When not reclined, the Ludden has a height of 43 inches making it oversized in comparison. The seat itself is well sized as well. It sits a good 20 inches form floor level and is about 21 inches wide between the arms. So larger size bodies will appreciate the space. The 25 inch depth to the seat makes it a great fit for people with longer legs. However I found the armrests while very soft and plush to be slightly lower than I expected. This is not a huge deal as I recline most of the time and it’s not an issue. Overall this is a simple yet amazing recliner. It also has the rocker feature enabled when not in recline mode. Which is a nice touch. The simple to use handle makes engaging and disengaging reline mode fairly easy. For shorter people, they may find the handle a little low down. But us taller folks will find it a great height. Ashley Furniture round out the top 5 recliner chairs for tall people with this stunning faux leather ‘Yandel’ power lift recliner. With similar measurements to the Ludden chair above, the Yandel is another good fit for taller folks. When fully reclined the Yandel offers a generous 69 inches of length and about 20 inches between the arms. So plenty of space to lounge around and take a afternoon nap in the Yandel. Especially as this chair reclines all the way back. The only problem is that you may find yourself taking too many naps because it is so comfortable and easy to sleep in. 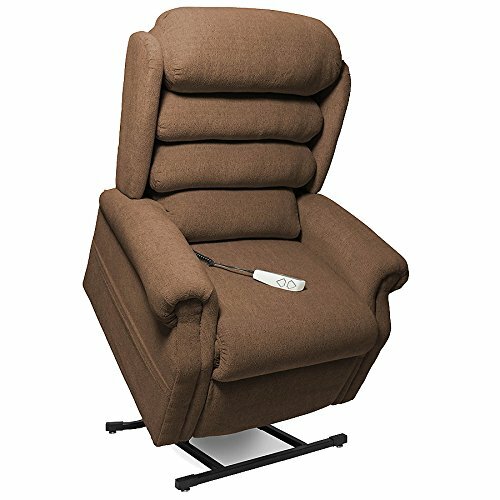 Being a power lift recliner you can forget about any concerns you previously had with getting in and out of the recline position. With the push of a button you can decline back into position and completely lift yourself out of the chair if you desire. The Yandel is another quality power lift chair that comes with a battery backup power source. It uses 2 9V batteries to recline back into position should you experience a power outage. Being a power lift recliner you hope that the chair is well constructed. The Yandel is one of those rare high quality constructed chairs. So it weighs probably more than you are expecting. A whopping 139 pounds, but do remember it is made form heavy duty materials and even has a steel reinforced seat. So you can be assured of it’s strength and longevity. But this too may have you fearing assembly. Thinking it’s too heavy to assemble. The good news it that all up you won’t spend more than 30 minutes putting the final touches on the Yandel. It is packed and delivered in pretty much 3/4 assembled. So you just need to put the final touches on it and you’re away. Fits through standard 30 inch doorways too which is nice. 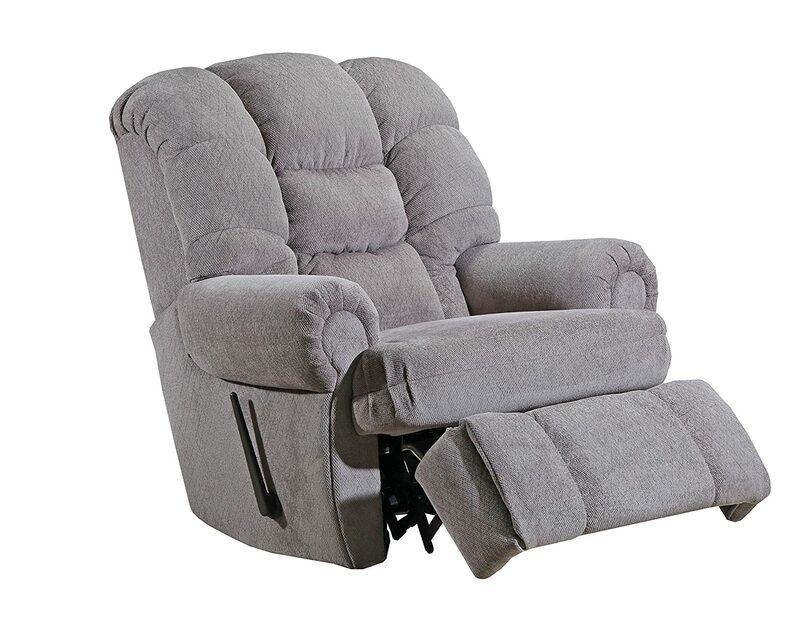 Overall its a beautiful recliner that does all the hard work for you. While buying a reclining chair online is becoming a popular practice, not everyone is willing to do so. For the best results, it is advisable to check your local furniture store for tall recliner chairs. In store you can physically touch feel and even smell the chair before buying. This is the best way to find out if a chair is going to be big enough for your body. But its important to not be side tracked by appealing features like extra padding, push buttons and drink holders. 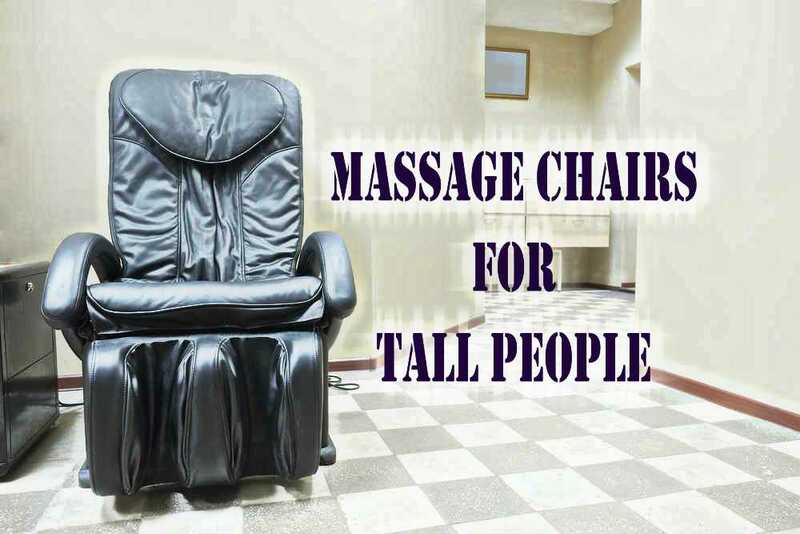 The aim of the game is to find a recliner that fits your tall body. Sometimes we get so amazed by the comfort of the chair that we forget that our feet are dangling over the end or our heads are not correctly supported. This can end up with you buying a wrong fitting chair and once the initial phase of comfort and wow appeal wears off you will notice that ‘hey, this chair is too small for me’. So always try to buy with the intent of the recliner chair suitable for a tall person. peoplelivingtall.com is a participant in the Amazon Services LLC Associates Program, an affiliate advertising program designed to provide a means for sites to earn advertising fees by advertising and linking to Amazon.com Certain images that appears on this site comes from Amazon Services LLC. Amazon. This content is provided ‘as is’ and is subject to change or removal at any time. Amazon, the Amazon logo, AmazonSupply, and the AmazonSupply logo are trademarks of Amazon.com, Inc. or its affiliates.